Pneumadyne has long been a leader in the design and manufacture of high performance pneumatic components. We offer a full line of standard pneumatic fittings which can be modified to better meet your needs, or we can develop completely custom pneumatic fittings that will match your exact specifications. Our skilled engineering team will work with you in the design and manufacture of your custom pneumatic fittings, from the prototype stages through full production, to guarantee that the products you receive meet your performance and system requirements. We can work from your design files, or create a new design that meets your needs for fit, form, and function. We can manufacture your custom pneumatic fittings from brass, stainless steel, aluminum, or titanium. Other specialty materials may be available upon request. Pneumadyne is well-known for the quality of our pneumatic fittings, and that same commitment to quality holds true for the manufacture of custom pneumatic fittings, as well. We’ve been designing and manufacturing custom components since 1976, and have over four decades of experience in working with customer applications. Our engineers strive to deliver innovative solutions for each customer’s unique needs. 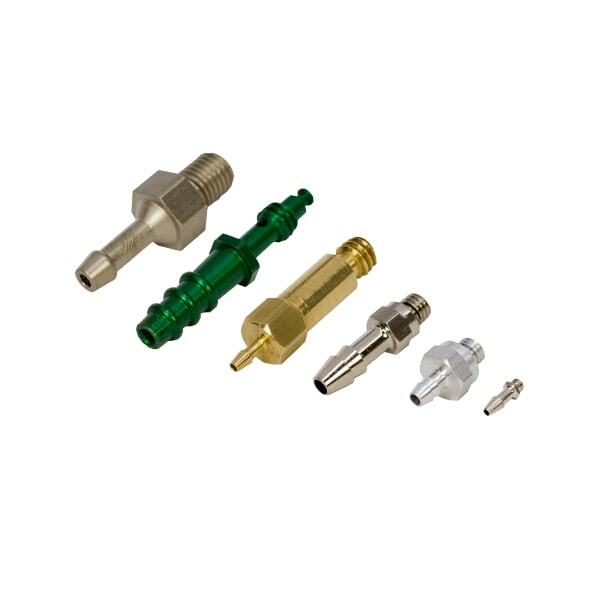 Quotes for custom pneumatic fittings can often be turned around in as little as 24 hours. Our advanced manufacturing capabilities enable us to provide high performance, high precision custom pneumatic fittings at tolerances within ± 0.002” to meet your specifications. We are your Number One source for custom pneumatic fittings. Request a quote today, or contact Pneumadyne for more information.